Looks alone give the brand new BMW 8-Series Convertible loads of road presence. The low slung German autobahn eater makes very short work of intercity journeys loaded to the hilt with premium features and blessed with superb comfort. Of course under the hood lies a newly enhanced twin-turbo V8 that is absolutely awesome. Both hard- and-soft-top versions of the new 8 Series are available in Australia, and they are the perfect replacement for the old 6-Series Coupe and Convertible. M spec models get a whammer of an engine in the form of the new 4.4-litre twin-turbo. The M spec model is what we are getting here to start with, and this means it comes with the xDrive treatment, meaning that the 390 kW of power and 750 Nm of torque drives the tremendous AWD set-up via the slick eight-speed sports automatic transmission. Boasting an electronically controlled limited-slip rear differential, an M performance-tuned adaptive M suspension with active anti-roll stabilisation (for less body lean during cornering) and variable integral active steering (rear-wheel steering) sets the scene for awesome handling dynamics and control. You’re set to enjoy full access to quick, creamy response at any engine revs, and giving it the full stick is gloriously fun! BMW specify that the 2019 BMW M850i Convertible does the 0-100 km/h sprint in just 3.9 seconds. An electronically controlled top speed of 250 km/h is standard, though without the limiter 300 km/h has to be an easy meet. I love the 2019 exterior design. You can get the car in eight metallic colours. It is stunning sitting on 20-inch alloys shod with 245/35/R20 tyres at the front and 275/30/R20 at the rear. Lovely broad lines accentuate the flow of speed that this new Convertible is all about. The Convertible’s roof takes just 15 seconds to open or close, and opening and closing the roof can be done at speeds of up to 50 km/h. A nice dark black soft-top colour is standard – with an anthracite silver soft-top available at no extra cost should you prefer the lighter contrast. Massive twin exhaust outlets finish of the wide-and-low rear off beautifully, and if you happen to catch a glimpse of the front of the new 850i in your rear-vision mirror the big kidney grille looks huge and intimidating as it bears down on you. As with other premium BMWs, the 2019 BMW 8 Series Convertible comes equipped with BMW’s new laser headlights, which BMW says will throw 600 metres of light down the road ahead in clear weather conditions. That’s very impressive, making night driving in an 8 Series about as safe as it gets. Gorgeous seats and beautiful design make time spent in this new convertible marvellous. Similar levels of craftsmanship, ergonomics and comfort are not easily come by, and BMW have done a wonderful job at making this superbly comfortable over long distances. Just imagine: top down, warm wind in the hair and lovely burbling V8 power. 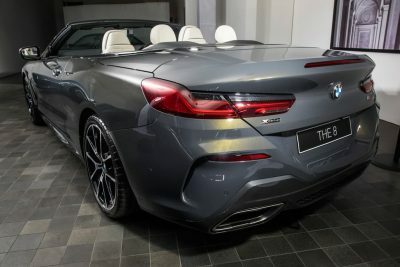 Actually there’s minimal cold wind inside the new 8 Series Convertible cockpit at all, because the BMW 8 Series Convertible comes standard with the clever BMW Air Collar which gives the occupants the option of channelling warm air to the backs of the necks when roof-down driving in cooler weather. BMW’s individual ‘Merino’ leather interior with sports front seats, the Heat Comfort Package (front heated door/console armrests and steering wheel), heated front seats, soft-close doors and wireless smartphone charging are part of the M-spec convertible’s standard features. 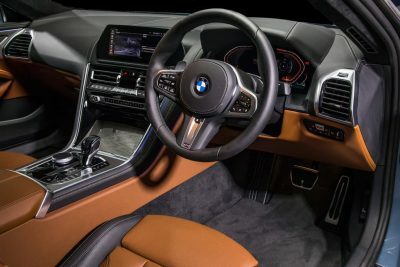 The car comes equipped with BMW’s Live Cockpit Professional system that is a 12.3- inch customisable instrument cluster together with the BMW Head-Up Display that’s also linked to the 10.25-inch Control Display. The infotainment system is driven with voice control (with natural voice recognition) and also boasts the latest Navigation System Professional with speed limit information as part of the package. Other features include: Parking Assistant Plus, a rear view camera, 3D view and reverse assist, Driving Assistant Professional and BMW’s Night Vision Camera with Pedestrian Recognition, Apple CarPlay, a Connected Package Professional with real time traffic information and a handy new digital key. If you have the right Android smartphone, then you can even unlock the car by holding your smartphone up to the door. The reverse assist is a relatively new BMW feature (also fitted to the new 3 Series). So, if you end up getting stuck in a narrow, dead-end street for example, the system ‘remembers’ the last 50 metres you’ve travelled provided it’s at no more than 36 km/h. When the system is activated, the automated reverse assist feature will reverse the car out of the narrow confines without any driver input required. If/when this scenario does happen to you, you will be hugely impressed and relieved when the car back tracks so easily by itself – a pretty amazing feeling! While not offering a very large boot space, the 350-litre luggage capacity feels useful enough for those romantic long weekends away. And you sit low down in the wide and long BMW four-seater 8-Series convertible. Now, go and enjoy. The 2019 BMW 8-Series Convertible offers a matchless experience. 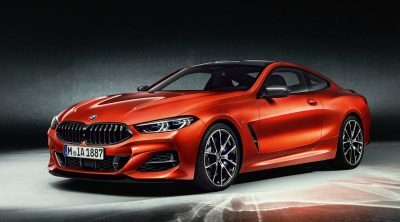 For any more information on the 2019 BMW 8 Series convertible or, for that matter, any other new car, contact one of our friendly consultants on 1300 303 181. If you’d like some fleet discount pricing (yes even for private buyers! ), we can submit vehicle quote requests out to our national network of BMW dealers and come back with pricing within 24 hours. Private Fleet – car buying made easy!